Ginkgo Biloba Certified Extract™ 120 mg - 365 Vegetarian Capsules from Life Extension® is an herbal supplement that supports blood circulation and may slow down the aging process. Gingo Biloba is one of the oldest types of trees known on earth. Ginkgo Biloba extract (leaf) present in this supplement from Life Extension® could enhance the flow of blood to the brain‚ arms and legs by modulating the flexibility of blood vessels‚ thereby promoting smooth flow. It may possess antioxidants and hence may be able to protect blood cells from harmful free radicals. It could also help increase the effectiveness of nervous function by improving the supply of oxygen and nutrients to nerve cells. As people get older‚ blood vessels may become narrower. Ginkgo Biloba by its ability to regulate the blood flow‚ could ensure adequate supply of oxygen to the body. In addition‚ it could also provide relief from pains‚ cramps and weakness in the legs and arms. Ginkgo has been a part of traditional Chinese medicine for many years. 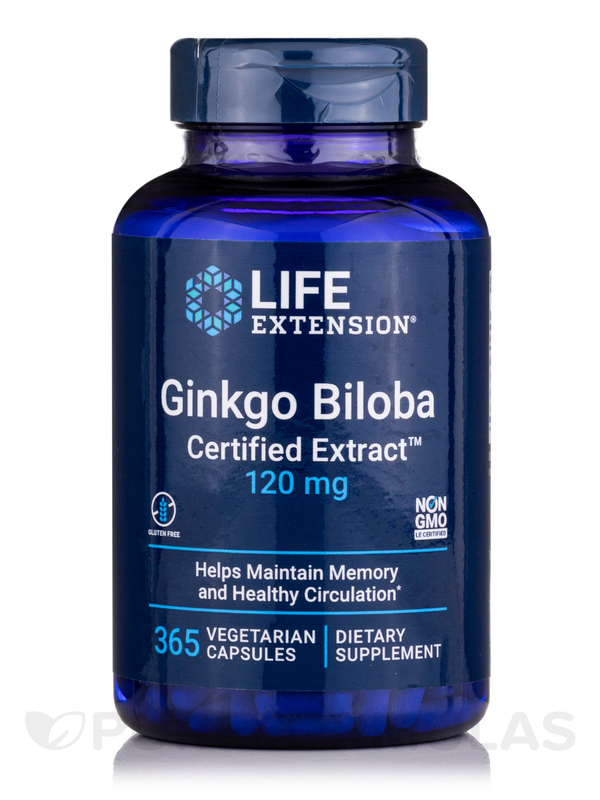 Improve your circulatory and neuronal health with Ginkgo Biloba Certified Extract™ 120 mg - 365 Vegetarian Capsules from Life Extension®. Other ingredients: microcrystalline cellulose‚ vegetable cellulose (capsule)‚ vegetable stearate. Take one capsule daily with or without food‚ or as recommended by a healthcare practitioner. If you are taking anti-coagulant or anti-platelet medications‚ or have a bleeding disorder‚ consult your healthcare provider before taking this product. Ive been using this ginkgo for about 6 weeks now and almost immediately noticed a difference in my memory. I recall things vastly better than I used to - its quite amazing. And the price is great for the quantity. I take 1/2 a capsule in the a.m. in m smoothie and the other 1/2 at night in water. From what Ive read its better to spread out the dosage.